Destress & Reboot Retreat is designed for people who have pushed themselves towards exhaustion, and people who need to restore their lives, after receiving health treatments. The retreat helps you to unwind and restore your energy level. It will give you a refreshed start with a clearer mind. You will be more focused and better equipped to make necessary changes in order to prevent yourself from falling into the same pit again. You will be given the tools to manage your personal and professional obligations, without exhausting yourself. At Copal, they strive on helping their guests have the perfect balanced retreat, by optimizing your daily activities with all they have to offer. You will enjoy two tours to a local cenote and Tulum, bike excursions, paddle boarding, ecological tours, hikes, kayaking, snorkeling, nights out on the town, while also giving you the chance to kick it back with a coconut beverage, and recharge. Nothing is enforced. Your week, you're here to enjoy. During this yoga holiday, you will be provided four nights of accommodation. Copal Retreat features large open areas for practice, open floor living and dining area, and a fully-equipped kitchen. Detailed Itinerary is sent upon confirmation of your booking. Only a 25-minute drive away, you will find the Mayan ruins in Tulum, a wonderful cultural experience. After this, you will head to one of the best beaches in the world and enjoy for a couple of hours. This is a truly memorable experience with fantastic food and drinks. Cool off from the hot sun, and escape to the secret underworld of turquoise pools, where Mayans communicated with the gods. In this hidden location, you can swim in mineral rich waters, in magical caves, under a jungle-framed sky and feel lost in another time. Daniela Manzur will be one of the instructors of this retreat. She has been very fortunate to receive teachings from various masters that have traced her lifestyle forever. During this week together at Copal Retreat, she will work on the classic sequences with some modifications. This work will challenge you: focusing on your roots, creating conscience in the ‘here and now’ by letting go of the mind and connecting with your internal knowledge. This will will lead you to a continuous physical body connection and a new perspective as spectator of your own story. Linda Bjork is a natural born Medical Intuitive Energy Healer, and a trained Life Coach. She was trained by a successful business man from India, owing several companies, operating globally. He taught her his craft, and today she teaches hers. She learned to establish her own business and she operates in six countries already. She learned to use her intuition for the right timing and her energy healing for good health. She was trained in getting control of her thoughts, which gave her laser focus and emotional balance. Everyone can find true love, success and happiness. Small bay south of Playa del Carmen. Paamul beach features white sands with some exposed limestone and lots of palm trees on the beach for natural shade. The offshore coral reef remains the most breathtaking and well-preserved attraction on Paamul beach, guests will enjoy hours of snorkeling, diving, kayaking, and paddleboarding. Daily breakfast, lunch, and dinner are included except one lunch and dinner that will be away from the retreat. You will also be served with complimentary fresh fruit refreshments, tea. and coffee through-out the day! Our on site chef will customized your meals according to your dietary restrictions. This retreat is vegan and vegetarian friendly. Temazcal is the Aztec ceremonial “steam” to cleanse the body, mind, and spirit using local herbs. For this excursion, it is suggested that you do this mid-week so that everyone has time to acclimatize to the heat. Especially as it will require a day of juicing or cleanse before you get there. It is a 45-minute drive from Copal so would be part of a day trip. It is also recommended that you include a visit to a local lagoon or cenote. The cost is 50 to 70 USD, depending on the number of people going. Transportation is included. Visit an aquatic park partly based in the Caribbean, including open buffet, snorkeling, zip-lines, and unlimited access to water-rides and jungle adventures. This is a day trip, and you will be leaving the house at 08:30 am and get at about 06:00 p.m. The cost is approximately 90 USD. Playa del Carmen is a 15-minute drive to the entertaining town of Playa del Carmen. For a night excursion, you can leave after the evening yoga in time for drinks and dinner in Playa. Most shops stay open until 09:00 p.m. or 10:00 p.m. The cost is approximately 100 USD, depending on numbers an on how late you would stay. There are two options on offer in the area. If you want to visit Cozumel, you can take the boat over to the island for some of the best dive sites in the world. You can change this into a day trip too. Another option is Akumal, where it is only a 15-minute drive to the local dive center from there. Included in the price is a one-hour relaxation massage. Local masseuse can offer several types of massages or treatments upon request, sessions will be done either on the beach or at the balcony at the retreat. Most popular " janzu massage" a technique innovated in Mexico, done in the Ocean as optional massage for an additional fee. Please book your flight to arrive at Cancún International Airport (CUN). Copal Retreats includes airport transportation, one van the day the retreat starts and one van the day the retreat ends. If you decide to arrive one or two days early or leave one or two days late, airport transportation will not be included but Copal Retreat will help you arrange airport pick up. In case of conflicting reservations (sometimes 2 bookings are made at the same time for the same room) Copal Retreat asks for a 24 hour confirmation period on your room. First come first served approach. Copal Retreat thanks you for your patience. Airport: Cancún International Airport Airport transfer included: Cancún International Airport No additional charges. You can request this in the next step. 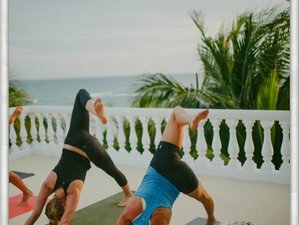 Copal Retreat organizes fun-filled soul-soothing yoga retreats in the turquoise waters of the Mexican Caribbean to revitalize and renew your body and spirit.